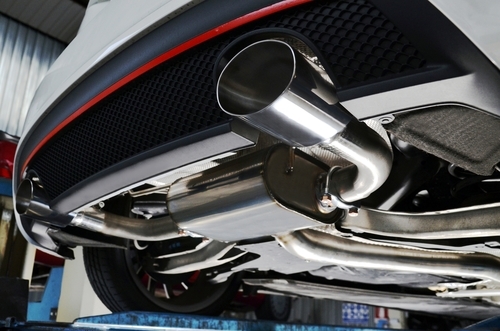 At Freeway Exhaust and Tyre Centre, we replace and repair many different types of exhausts for customers throughout Tunbridge Wells and Crowborough. The exhaust of your vehicle has several different functions in order to reduce sound and heat coming from your engine, as well as controlling the potentially harmful emissions that are emitted from the vehicle each day. The exhaust system is connected with various clamps, gaskets and other parts which ensure that it works properly. It is the exhaust system that has the potential to improve the performance of the engine, by ensuring that the output and fuel efficacy is increased to a much higher level. We only use industry leading brands in order to ensure quality. If you are interested in a Scorpion Exhaust please get in touch with Freeway today on 01892 520022. One of our team will be able to go through your options for exhaust fitting and replacement. Why Choose a Scorpion Exhaust? With many years of experience and industry knowledge, the Scorpion brand of exhausts has been a driving force in winning several motorsport championships. Scorpion has massively intensified their reputation through their developments within the automotive sector. If you are searching for an exhaust of high quality, great efficiency and value for money, a Scorpion exhaust could be just what you are looking for. There are many different types of exhausts available. Every product from Scorpion is effective as the next. All you have to do is purchase one, get it fitted and you will see amazing benefits as soon as your vehicle has been driven afterwards. These exhausts make very little noise and are made from high-quality stainless steel that is polished in order to create a shiny exterior. They also offer a lot more power efficiency for your vehicle, which typically adds between 5-10% additional power to the vehicle. Most scorpion exhausts are also interchangeable! This is ideal for any motorsport vehicles. If your exhaust performs better then more air will get through to your engine, giving your car that extra boost that it needs. With the Scorpion brand, you get all of this power but at the same time, the exhaust is not loud. There is also a range of different options, enabling you to choose from various models in order to select a specific noise level that is suitable for you and your vehicle. Scorpion has developed some of the best exhausts on the market – consider purchasing a Scorpion exhaust with Freeway! If you are concerned about the performance of your exhaust then you can come in for a free check with Freeway. We will check over your vehicle and explain to you what needs doing and then provide you with a quote. We will never pressure you into making a decision but we will simply provide you with a fair and simple explanation to make the decision easier for you. If we have access to the correct parts then your car can likely be completed on that same-day. If we do not have the parts then they will be ordered with an estimated time for delivery, so your car can be booked in with the team. Our garage is based in Tunbridge Wells and we serve all surrounding areas, so you’ll never have to look elsewhere for the best exhaust services. The team at Freeway have been fitting exhausts for over 40 years and have lots of experience in dealing with a variety of different cars. If you are looking for an experienced exhaust service then simply get in touch with Freeway today! We will be happy to answer any queries or questions you have regarding our services.